It took me a while to decide where I'd run this morning. The easy choice was to stay in my neighborhood but I'm getting bored seeing of the same roads, houses and cars. I considered Stillwell Woods because I haven't been on the trails in a few weeks. My goal was to run at least six miles today, so I figured I'd go to the Bethpage trail where I do better on longer runs. It was "wicked cold" this morning (as we'd say in Boston) so I needed to gear up properly. Running in cold weather usually doesn't bother me except in cases when the wind chill causes my glasses to freeze on my face. Today's weather was fairly calm and I wore plenty of layers. That included my new Opedix Knee-Tecs that I scandalously wore without a top layer of shorts. I parked in the Bethpage lot and ran up the hill toward the trail. I then decided to head north so I could follow the mile markers to the 5K point. Turning around there would get me my planned six-plus mile distance. I didn't have the same level of energy today that powered me through yesterday's surprisingly good run. Even so, I felt strong enough to take on the ribbon of hills that awaited me. The temperature during my run was 34° with a 10 MPH wind from the west. Since I traveled north for the first half and then south for the second, I didn't experience much in the way of resistance. It did feel chilly and I didn't see a single runner, cyclist or walker until I reached my second mile. 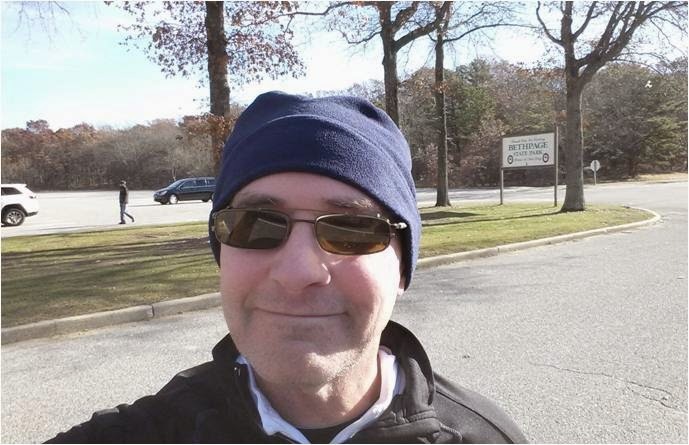 I run at Bethpage so often that I recognize a lot of people on the trail now, and based upon their greeting when we pass, I assume that some of them recognize me back. There's one woman I see every time I run there who always gives me a big smile and wave. Today's run was more LSD than PDQ so I wasn't disappointed that it took over an hour to cover my route. Overall, I was pleased with the run and happy that I didn't settle for another workout around my neighborhood roads. I may do that tomorrow, but at least today I got to experience some hills and look at scenery that didn't include a bunch of boring houses and cars. No shorts? Oh crap! And I missed it! Celia, you're looking at a big PR tomorrow! I may try to meet you over there. Depending on my sleep tonight. No idea why my name came up as A-Mom! Methinks me kids are screwing with me gadgets. I think it's going to be my new look. I just want to do my part A-Mom.